Many anatomical and physiologic changes occur during pregnancy altering the presentation of pathologic conditions (Table 1). The fundus of the uterus is generally located at the umbilicus at 20 weeks gestation and just inferior to the xiphoid process at 36 weeks (Fig. 1). This leads to displacement of the intra-abdominal organs, thus altering the location of abdominal pain and tenderness found with certain conditions such as acute appendicitis (14). In addition, while lying in the supine position, the uterus may compress the inferior vena cava and aorta causing a decrease in venous return to the heart and a decrease in placental perfusion, respectively. The changing fundal height must be remembered and evaluated before accessing the abdominal cavity for laparoscopic procedures (Fig. 2). By altering the location of initial abdominal access according to fundal height and using maneuvers to elevate the abdominal wall during insertion, either the Hasson technique or Verres needle may be performed safely (12,13,15). 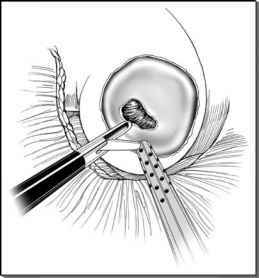 Initial placement of the Verres needle or trocar into the left subcostal region may be necessary as the uterus enlarges in the second and third trimesters (16,17). Ancillary trocars are then inserted under direct visualization, modifying their typical location according to the size of the uterus (18).